Rat Epidermal Keratinocytes (REK) from Cell Applications, Inc. provide a good model system to study many aspects of epithelial function and disease, particularly those related to skin biology and toxicology. It was shown that TGFβ1 treatment decreased c-Myc mRNA in REK which, taken together with the TGFβ1-induced growth arrest exhibited by keratinocytes and opposite results obtained in other cells, suggests a correlation between c-Myc mRNA expression and the mitogenic response. Additionally, REK were used to demonstrate that pathological increases in keratinocyte sodium channels Nav1.1, Nav1.6, and Nav1.8 expression may contribute to pain by increasing epidermal ATP release, resulting in excessive activation of P2X receptors on primary sensory axons. REK were also used to demonstrate that laminin 332 deposition is inhibited by ionizing radiation and, in combination with slower keratinocyte migration, can contribute to the delayed wound healing of irradiated skin. (Click to Enlarge) Rat Epidermal Keratinocytes: REK. 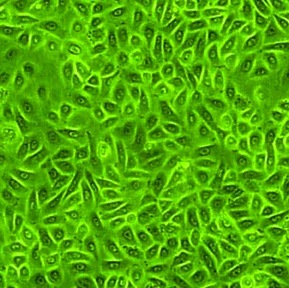 Keratin producing cells isolated from skin tissue. REK do not expand and cannot be subcutured. Thaw & plate REK directly to assay format. REK will undergo only 1 or 2 doublings. Jourdan, M., A. Lopez, E. Olasz, N. Duncan, M. Demara, W. Kittipongdaja, B. Fish, M. Mäder, A. Schock, and N. Morrow. 2011. Laminin 332 deposition is diminished in irradiated skin in an animal model of combined radiation and wound skin injury. Radiation research. 176:636-648. Jasinski, K. 2009. Impact of Gaseous Nitric Oxide and Carbon Monoxide on Normal Excisional, Diabetic Excisional and Burn Wound Healing. PhD Dissertation, Ohio State University. Nakai, T., J. Mochida, and D. Sakai. 2008. Synergistic role of c-Myc and ERK1/2 in the mitogenic response to TGF beta-1 in cultured rat nucleus pulposus cells. Arthritis research & therapy. 10:R140.Zhao, P., T.P. Barr, Q. Hou, S.D. Dib-Hajj, J.A. Black, P.J. Albrecht, K. Petersen, E. Eisenberg, J.P. Wymer, and F.L. Rice. 2008. Voltage-gated sodium channel expression in rat and human epidermal keratinocytes: evidence for a role in pain. Pain. 139:90-105. Zhao, P., T.P. Barr, Q. Hou, S.D. Dib-Hajj, J.A. Black, P.J. Albrecht, K. Petersen, E. Eisenberg, J.P. Wymer, and F.L. Rice. 2008. Voltage-gated sodium channel expression in rat and human epidermal keratinocytes: evidence for a role in pain. Pain. 139:90-105.